"Reading Rhythms - Counting Music Expanded"
Phil and his son, David, have developed an expanded version of their free Counting Music web application. It is designed to provide students with a fun and engaging way to practice reading and counting musical rhythms. If you already have access to the expanded activity, please click here. 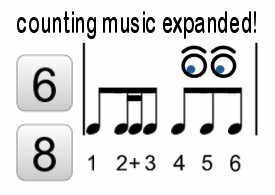 "Reading Rhythms - Counting Music Expanded” is a bundled product that includes the Reading Rhythms PDF book, and the expanded version of our free Counting Music activity. The Reading Rhythms PDF book includes 119 sets of rhythms that are sequentially arranged to develop fluency with syncopated music. The rhythm sets begin with introductory exercises using half notes and quarter notes, and gradually incorporate more complex rhythms using eighth notes, sixteenth notes, and triplets. An important feature of this system is its use of core rhythms, which are varied and permutated so the syncopated passages cycle through every beat of the measure. These core rhythms are also applied to a variety of different meters and time signatures, allowing the student to master 2/4, 3/4, 4/4, 6/8, 9/8 and 12/8. Sample pages to view: Table of Contents, and Quarter/Eighth Note Rhythms (12-19). The expanded “Counting Music” web application includes and plays all of the 119 rhythm sets (preloaded). In addition, it allows the user to design and save rhythms (via the “Email It” feature), unlocks the use of triplet eighths and triplet quarters, and plays the following time signatures: 2/4, 3/4, 4/4, 6/8, 9/8 and 12/8. The expanded activity is a web-based application that is available to use on your computer, smartphone or mobile device. After purchase, you simply enter your email address to use the activity, wherever you are! To purchase access to the “Reading Rhythms-Counting Music Expanded" web package, click the “Buy Now” button below. To purchase a site license, please contact Phil here.